Happy Friday all!! Are you as excited for Friday as I am?! 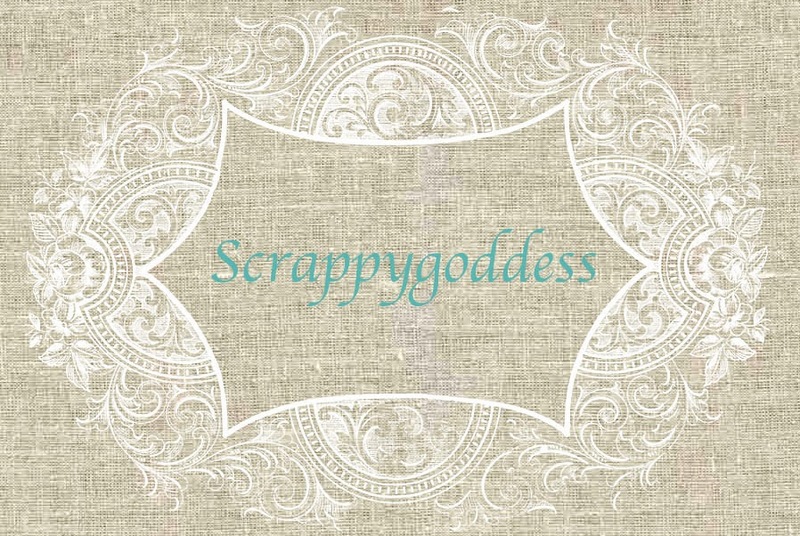 I had a super productive scrappy weekend last weekend using the Swirlydoos.com July kit Madame. Something about this kit just speaks to me and I adore it!! 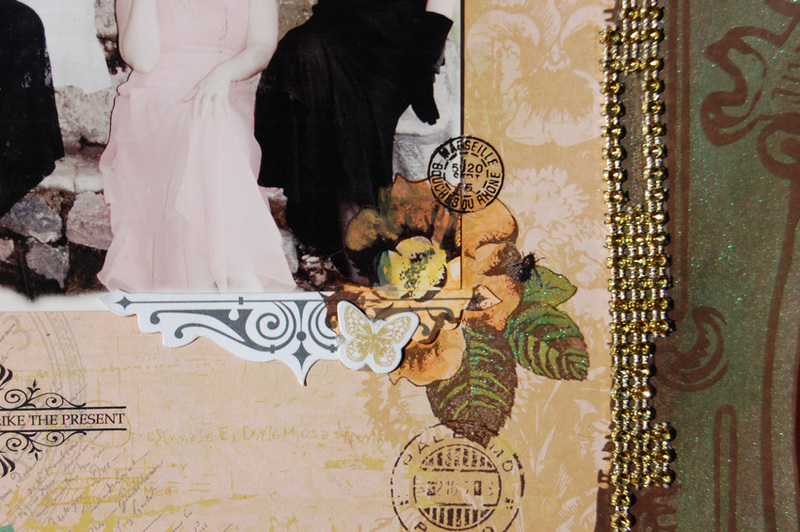 The first page I made was to show how to make the background page using the gelatos. 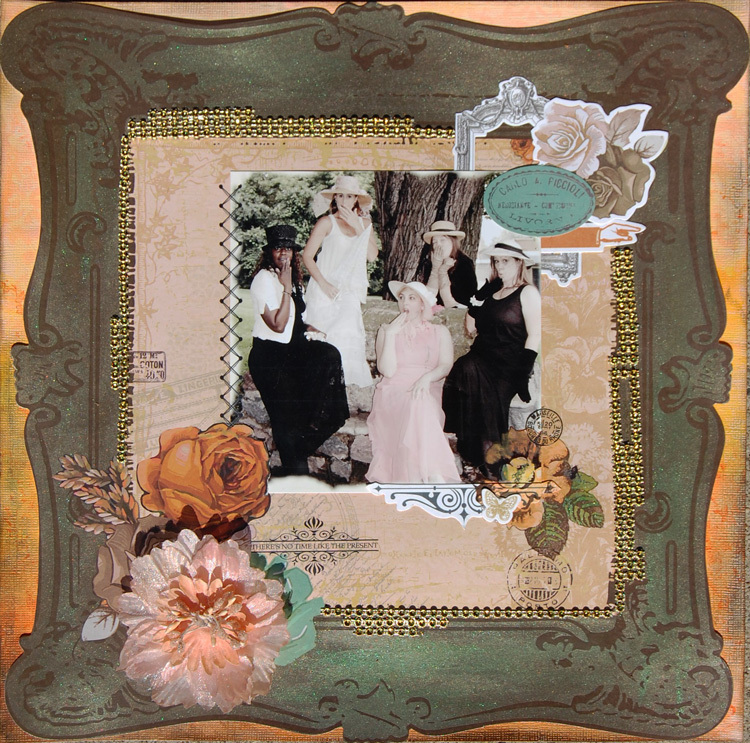 I loved the graduated piece from the Sunrise Sunset collection but just could not bring myself to use it as a background piece that was mostly covered up...so I improvised using the gelatos. I also used the gelatos to paint this gorgeous flower and create a cluster on the corner of my photo. This video shows you how to paint with gelatos as above and to apply direct to chipboard and get a gradient look as on the bird cage below. 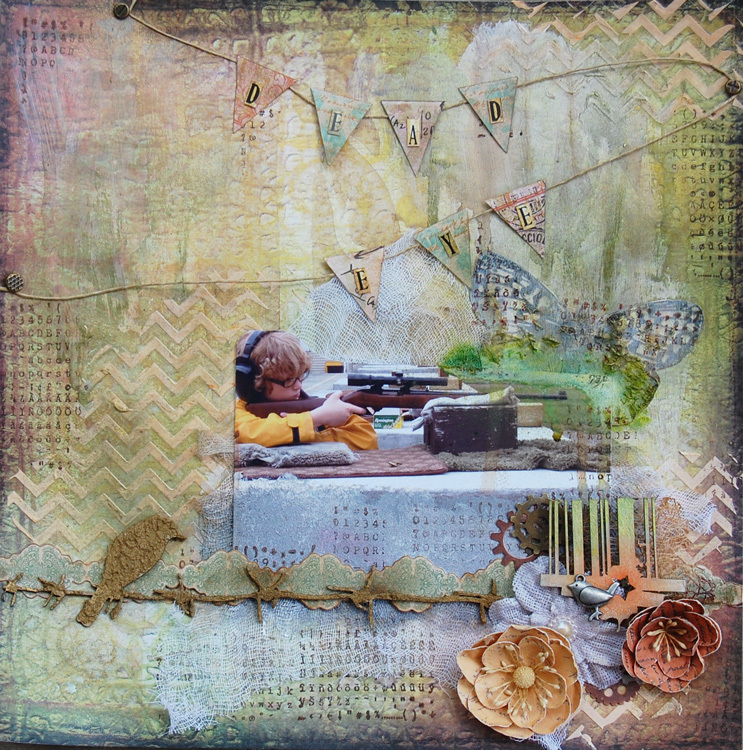 This is the page that I'm submitting for Angelica's Butterfly challenge over at Swirlydoos. I made this butterfly using the gelatos and the jar of Pumpkin spice silks glaze that was included in the kit. Here is a close up of the bird cage. I made the splatters using the Lindy's pigment powder that was included in the embellishment add on and using the dropper from the gelato tech kit. Here is another butterfly but this one was made using the TH distress markers and covered in Silks glazes for that shimmery effect. This page was not made for anything in particular. I love how this turned out. This is a photo of my son Colin when he went shooting with his dad. Here I used the gelatos to color the modeling paste a light orange and also used them to color the chipboard bar code. 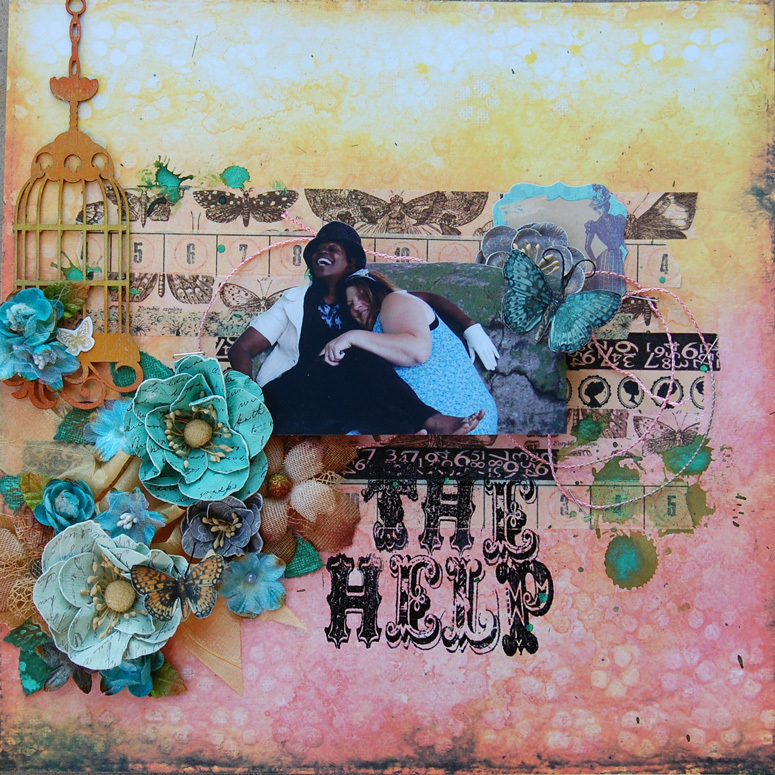 The bird on the barb wire was covered with the Ferro texture paint that came in the mixed media add on. I know this was a long post but I've been on such a creative streak I wanted to share it all with you so far. I hope you like all the different gelato techniques and I hope you try them for yourselves. I am a working mother of 4 who is completely addicted to the art of scrapbooking. I've been married to the love of my life for the last 13 years. I am the proud mother of an Eagle scout and a Weblos. My art has grown into a combination of some mixed media, scrapbooking, and random stuff for my kids school. I've previously designed for Eclectic Paperie, Swirlydoos, taught classes at a local store, and have even posted a couple of videos on my Youtube channel. Your comments are loved and appreciated. Thanks for stopping by. Earn Free Kits from Swirlydoos! !